True Foods is focused on growth via wholesome solutions to market trends and expanding the "made in Australia" base. Currently our products include a variety of flatbreads including but not limited to wraps, Naan bread, roti, tortillas, pizza bases and crumpets. We are consistently investing in new capabilities to allow for growth and innovation. We focus on bringing specialty items to market. For example gluten free, low sodium, high fibre, spinach tomato wraps, barley max wraps, quinoa tortillas, chia and sour dough tortillas. As a highly efficient manufacturer we easily segregate ingredient to ensure integrity, product safety and allergen specification. Our packaging is flexible to include zip lock bags and shelf ready cartons, etc. With all the health benefits and lighter eating options centered on wraps, True Foods is excited to introduce you to our range of wraps. 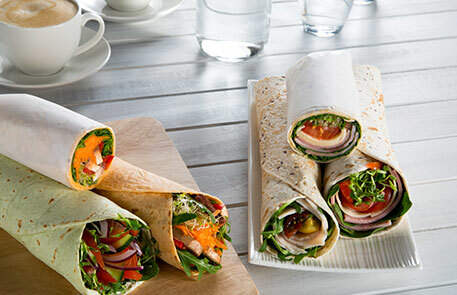 We offer a range of "everyday" flour wraps, as well as our range of specialty products. Sizes range from 6 inch to 12 inch and our specialty range includes Chia & Linseed, Multigrain, Spinach and Tomato. For further information on our complete product range, download our Foodservice Range List here. Allergen sufferers are very well tuned when it comes to finding the right foods. 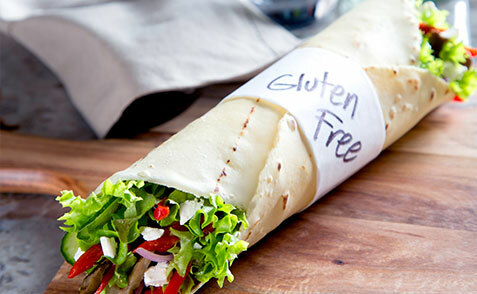 At True Foods we have made it easy for you with our range of Gluten Free Wraps and Pizza Bases. Sizes range from 8 inch to Jumbo. Not only are they Gluten Free, there also Dairy, Nut and Wheat Free. Our Gluten Free products are produced under strict conditions, in a full segregated Gluten Free production room. For more information regarding our Gluten Free products and tips on how best to use them, please download our Gluten Free Handling Guide. Flatbreads have been a core part of our range since our beginnings. In fact, we were the first company to offer Dipping Breads to the major supermarkets.